St. Andrew’s guiding principle is to make the school the best place for children to grow. More than 50 years celebrating tradition and empowering education. ...build the profile of St. Andrew’s pupils. Our Form I students went on an outing to visit the famous bookstore inside the ship “Logos Hope”. This ship is home to around 400 people from more than 60 different countries. The boat will be on Montevideo until April 21st. Our Form III students went on a camping trip last weekend. They enjoyed the lovely sunny weather, visiting some caves, “Parque Salus” and typical landmarks of Lavalleja. They also participated in the renowned night team games prepared by our Sports Team. St. Andrew’s School is a recognized, elementary, private school, which has offered first-class, child- focused education, from Pre-schoolers to the age of twelve, since its foundation in 1963 by Agnes Nery, its first Headmistress, Fay Crocker, Margaret and Sylvia Towers. Ms Nery a Scottish educationalist with broad experience abroad, after a short period in Uruguay, founded St. Andrew’s School. It built on the well-known Sylvia Towers nursery school, already functioning in the Crocker family house. She implemented the Scottish national curriculum adapting it to the country’s reality. Led by the unerring hands of Mrs Nery, their aspirations were to deliver the highest possible standards of teaching. With this leading vision and a strong personality that unquestionably left a stamp, a whole process was started and safely followed to place St. Andrew’s as the leading institution it undeniably is today. In 2013 the School celebrated its 50th Anniversary with a varied programme of activities that marked the occasion in style and showed a strong community spirit, a deep feeling of belonging and the fond memories all the school family keeps. St. Andrew’s is a specialist school for the age range of 3 to 12 years old, where English is used as the medium of instruction and first language. The curriculum is content-based and cross-curricular. Serious commitment to learning, broad cultural background, sense of purpose, and responsible, courteous citizenship build the profile of the students who leave St. Andrew’s. The school has approximately 350 pupils and the overall ratio of teachers and other professional staff to students is an average of 1:8, making it possible to care for individual needs, which is one of the main characteristics of the school. There are two classes per form and the average class size is 20 allowing for a great focus on developing a child’s strengths. It also an ideal class size for children to interact fruitfully with their peers. Qualified, experienced, committed and perceptive teachers work with dedication and care catering for different learning styles and intelligences so that each child has the opportunity of developing fully. Little Learners: This department embraces Beginners, Nursery, Kindergarten and Preparatory. Primary: This department comprises Form I to Form VI. After completing their primary studies, pupils at St. Andrew’s are academically, physically and morally fit to face the challenge of tackling the next phase of their education in any leading secondary school of their choice either in Uruguay or abroad. Being a primary only school gives us the advantage of seeing children grow as learners and thus select a senior school which best suits them and in which they will give their very best. 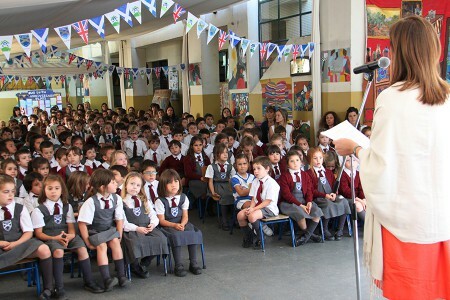 A fully bilingual primary education allows our children to reap the benefits of bilingualism itself such as a fine command of the target language and improved cognitive skills but also, and as importantly, helps children gain high respect for the best values of both Uruguayan and British cultures. As a result, they can continue their studies and function as effectively in a bilingual environment or at a school with a single language of instruction. The school is located in a residential area in Pocitos, only minutes away from all important districts in Montevideo. Our school attracts children from different neighbourhoods and provides transport to all city areas. The Crocker Art deco House, in which the school is still operating, retains a traditional atmosphere which accompanies the high quality British type education and the solid set of beliefs on which the school is founded. Sports take place at suitable facilities, rented by the School for this purpose.